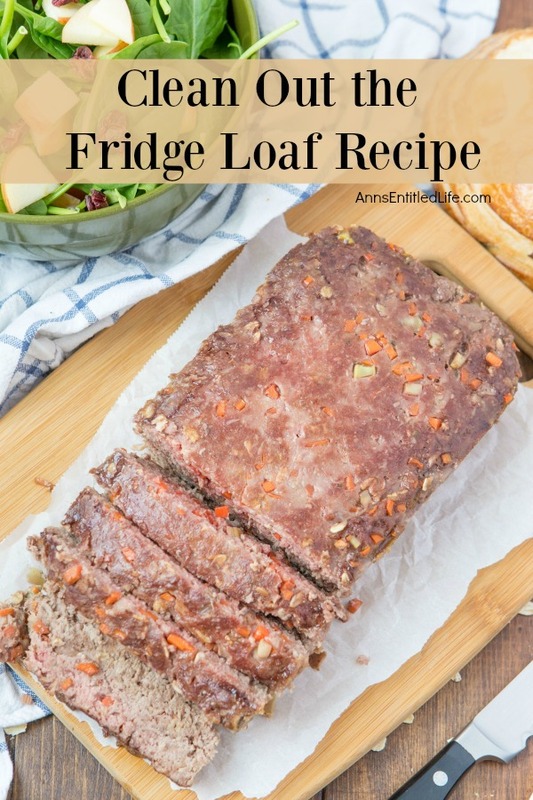 The perfect meatloaf recipe to make use of your leftover vegetables, grains and the ground beef, chicken, pork, or turkey in your refrigerator. 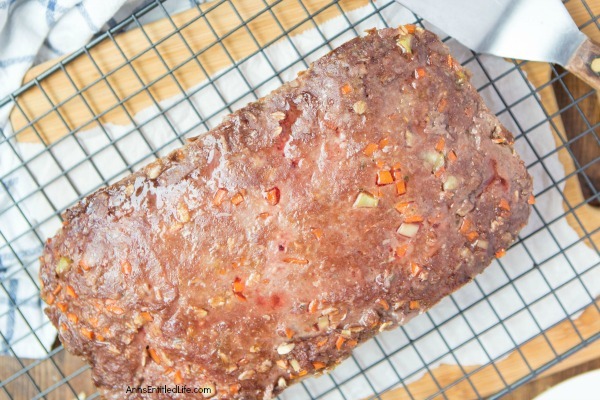 Easy to make, this yummy 2 lb meatloaf recipe turns out perfectly, and delicious, every time! Hubby purchased the book The Dog Ate It: Cooking for Yourself and Your Four-Legged Friends many, many years ago. It contains recipes that are fit for humans and dogs at the same meal. 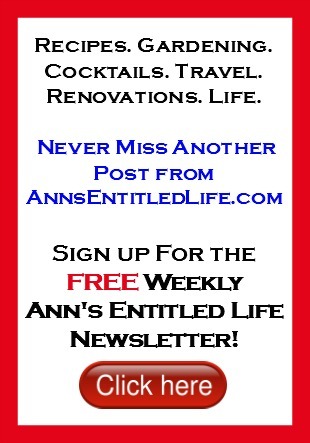 Now, those of you that read this blog may know that our pooch, Max, is extremely spoiled. He does each PetFresh at least once per day, but his other two meals are people food. So, hubby figured he would give this book a try. The recipe above is based on one in this book. 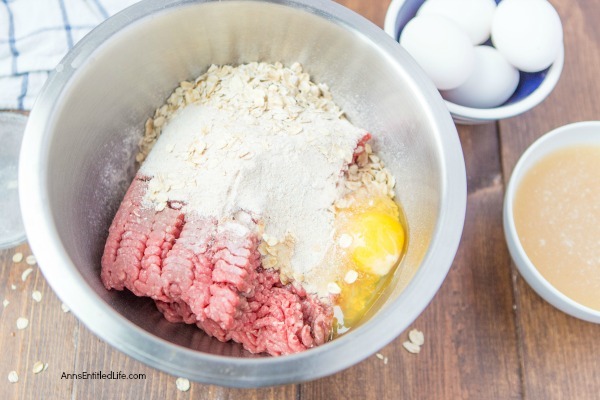 • I love this meatloaf pan! 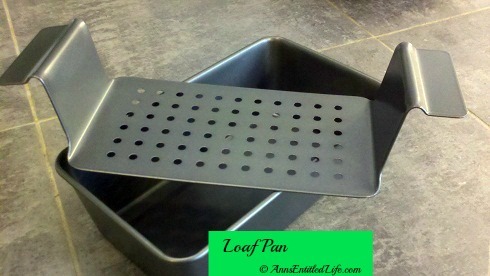 The loaf lifts right out when you use this pan, and the excess grease stays in the bottom. 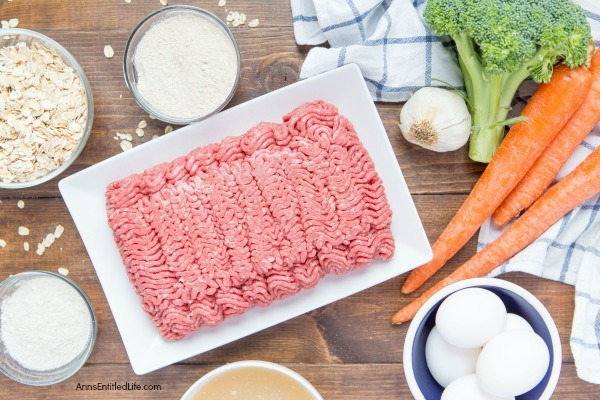 • We use lean ground beef (90-93%). 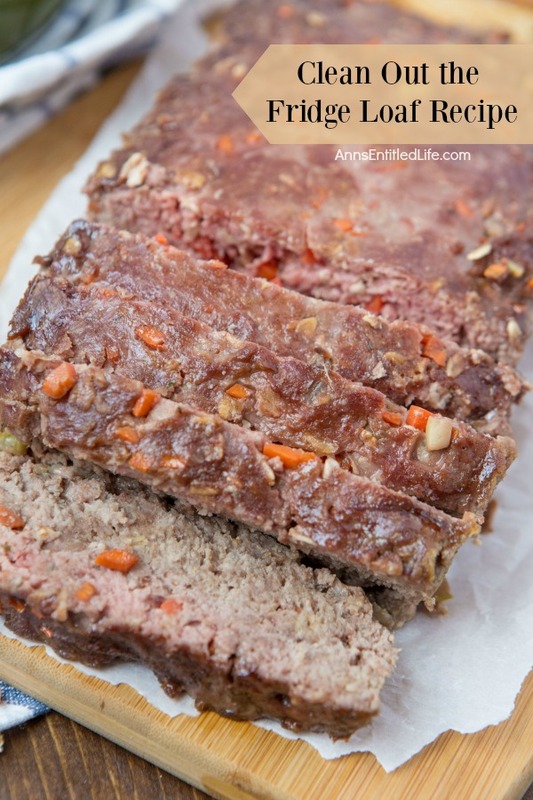 The original recipe says beef, pork, chicken, turkey or veal ground or chopped can be used to make this meatloaf recipe. 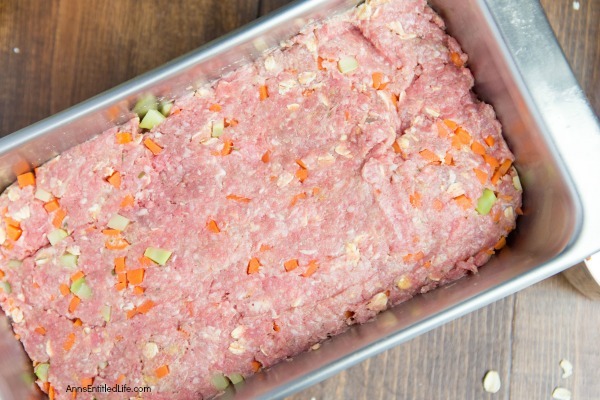 While we have combined pork and beef, we have not used ground chicken or turkey to make this loaf, and never just chopped meat – always ground. • We used oatmeal. The original recipe says bread crumbs. We have used gluten-free breadcrumbs on this recipe. • We use dehydrated vegetable flakes as they are cheap and easy to find. The original recipe calls for seaweed, sea kelp or seas vegetable. We have ised sea kelp in this recipe, and there is no discernible different in taste or consistency in my opinion. 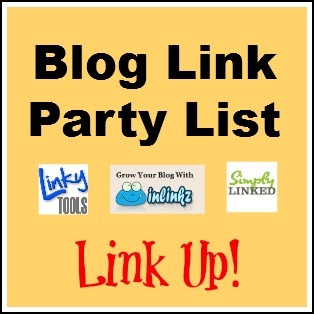 • The recipe calls for two cups of cooked vegetables. I’d suggest carrots and broccoli as that is what we use. 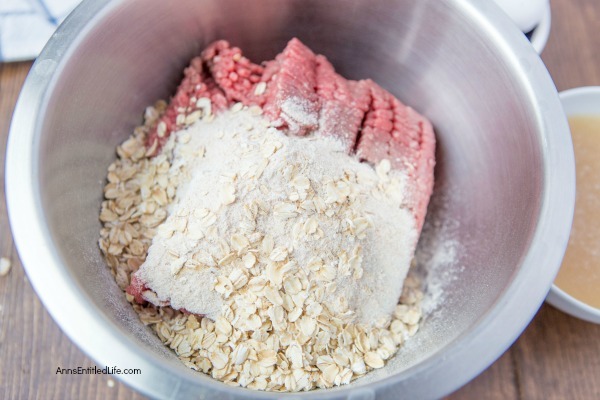 • Combine rye flour, barley flour, and oatmeal in a bowl. Set aside. 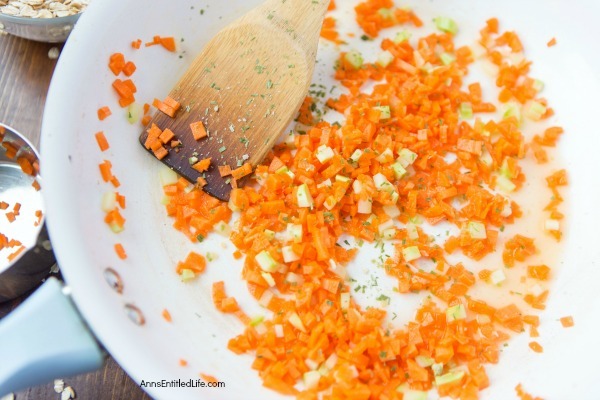 • Dice fresh vegetables (suggested carrots and/or broccoli) into small pieces. Cook in water (or extra chicken stock) with vegetable flakes, Garlic, and Salt-free Spike. Drain and cool. 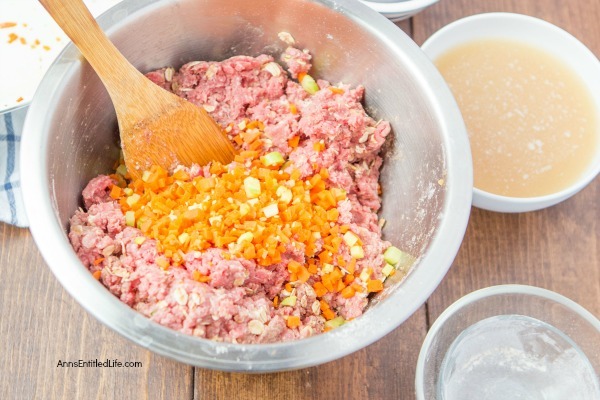 • Combine ground beef, ½ cup chicken stock, egg, cooled and cooked vegetables, and dry ingredients together. Combine well. 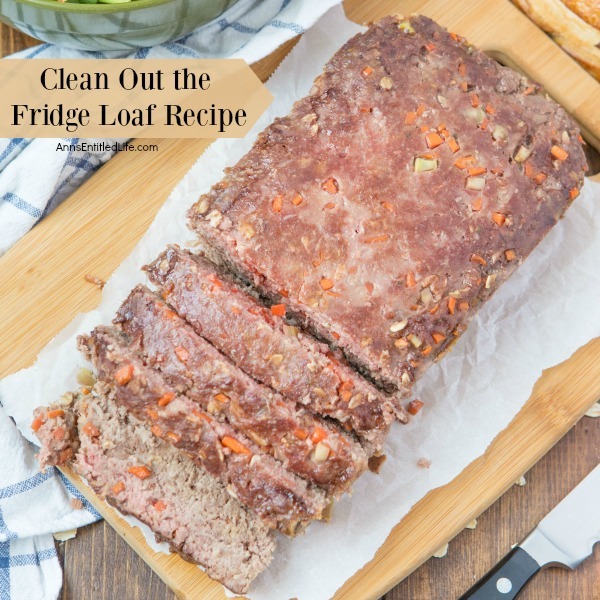 • Form into a loaf, and place in an oiled meatloaf pan. • Bake in preheated 350º oven for 45 minutes to 1 hour. 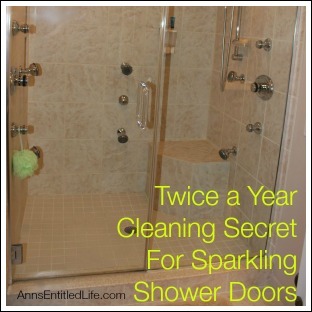 • Serve hot, refrigerate leftovers. 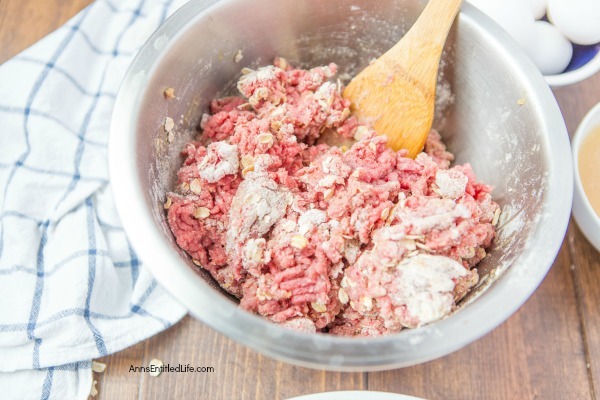 • Combine ground beef, ½ cup chicken stock, egg, cooled and cooked vegetables, and dry ingredients together. Mix well. 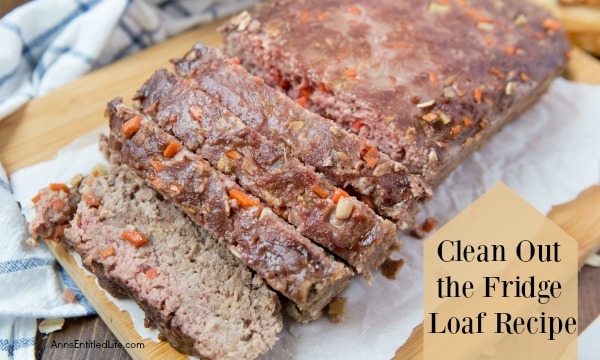 • To print the Clean Out The Fridge Loaf recipe click here. Sounds good! Looks good! How did Max & All like it? We liked it, Max liked it. We’ve made it several times and it always turns out well. OMG that dog is spoiled. My vet told me no to any kind of people food for Bridgette. I was really mad, I was taking carrots, chicken, some broccili, cooking it till tender then mixing it together and giving it to her. The vet said her delicate stomach won’t tolerate people food and it just is not good for them. I tried to explain about wild dogs in Africa eat meat, people too, we are meat, but he would have none of it. I actually got my frig cleaned out on Saturday and Sunday. Yes it took two days, I bought it six years ago and this is the first time I have cleaned it completely. I think I have mentioned my hatred of any thing that has to do with housework. I found terrible things in there. A bottle of barbeque sauce that was over two years expired, bad milk, Starbuck drinks almost two years old. I would say it was time. Sunday I washed it all and it is beautiful. I don’t understand how one person can make such a mess. I will have to have a talk with myself. Next I have to clean the oven, UGHHHHHH!!! Any volunteers??? 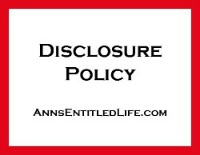 I am surprised your vet told you that… usually boiled chicken is recommended for a doggie with a delicate stomach. Guess he isn’t into a raw diet either, huh? So what does he recommend, Candie? I will pass on the refrigerator cleaning offer. Thank you anyway. I hate doing ours. Hate. It. You really feed your dog 3 meals a day? Wow no wonder Max is not real interested in eating, that is a lot of meals for a dog! I too have dogs with sensitive stomachs but I cut out all people food for them instead of cooking for them. That works for us. 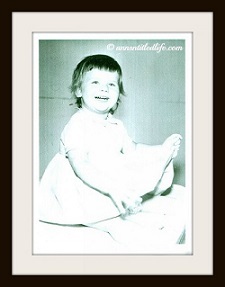 Yeah, we have to – he has little dog syndrome in many ways, including food intake. His stomach can only hold so much. Once he gets going, he starts to gobble (we insert dry to slow him down). Unlike a big dog, he can’t keep it down, so he’ll throw-up. Three small meals work best, although some days he decides to only eat twice. Max is max, he’s lucky his mommy and daddy loves him so! 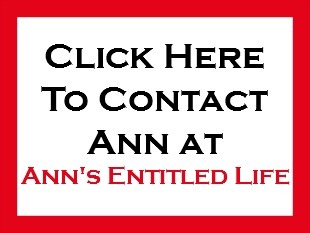 ♥ I would of never thought to put broccoli in my meatloaf Ann!